sold in February of 2019, the same amount as January 2019. 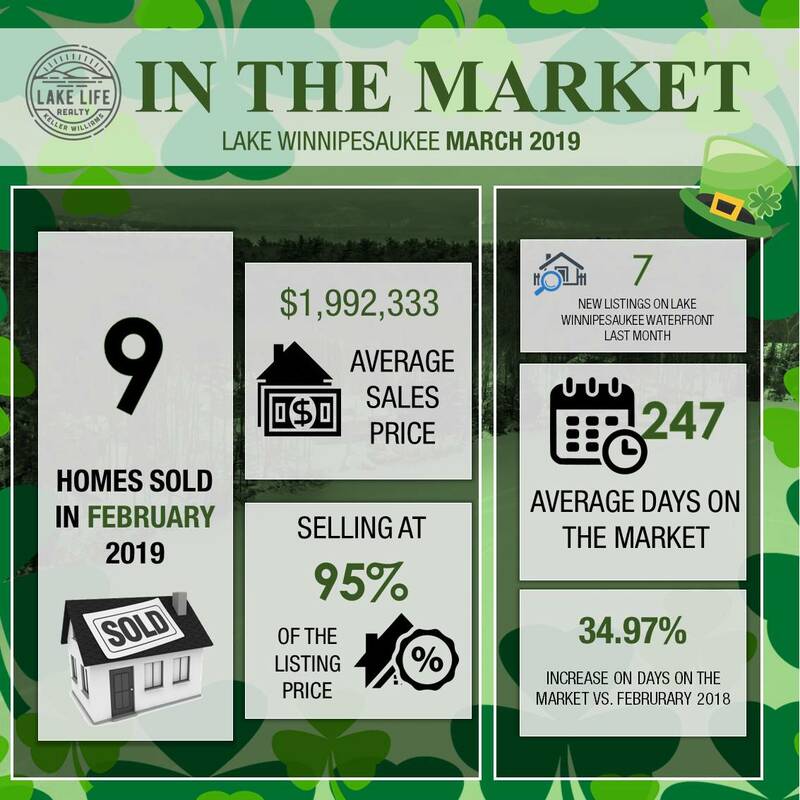 LAST YEAR only ONE sold on Lake Winnipesaukee in February in Wolfeboro. One sale is really driving the "mean" average Days on Market UP. Without this one sale that has a DOM of 1002 days the average of the others is 170 days. The sale that changes the values in this report greatly is the former Bahre property at Hopewell Point Rd in Alton. After a $3,300,000 price reduction it only took a week for this portion of the property to go under contract. The largest sale took place in Alton at 144 Hopewell Point known as "Long View". Asking $5,600,000 and closing at full asking price. This home was just shy of 39,000 sq. ft. Located on the tip of Clay point with 733 feet of shoreline, 9.48+/- acre estate, an oversized, 3-bay boathouse constructed of stone and mahogany has grandfathered, extra deep bays. Property includes a registered helipad and an adorable stone guest house. The property was first offered for $12,900,000 for this parcel. For the entire parcel they were asking $49 Million Dollars. Remaining FOR SALE includes 142 Hopewell Road and 116 Hopewell Road, directly abutting properties, two lots of record. The combined properties feature 861’ of lakefront and7.12+/- acres including a two-bay stone boathouse with extra deep slips, a stone amphitheater built into the banks of the lake with a 1-room stone cottage on it, plus an extensive piered dock system and walk-in sandy beach. In addition to all of the lakefront features, the compound offers an infinity pool with a waterfall, swim-in grotto with hot tub and bath, and a tennis court. 142 Hopewell includes four bedroom suites, nine baths, eight fireplaces, gym, movie theater, gorgeous paneled library, a hidden room, and a one-bedroom apartment over the garage. 142 can be purchased alone for $4,900,000. The post & beam Barn at 116 Hopewell Road includes a 41’ x 77’ great room with massive stone fireplace, two bedroom suites, living room and kitchen. Moultonborough claimed FIVE of the NINE sales last month. 75 Windermere was our listing located on Long Island. A beautiful Adirondack home that sold for $2,750,000 with the furniture. Click photo for the video. 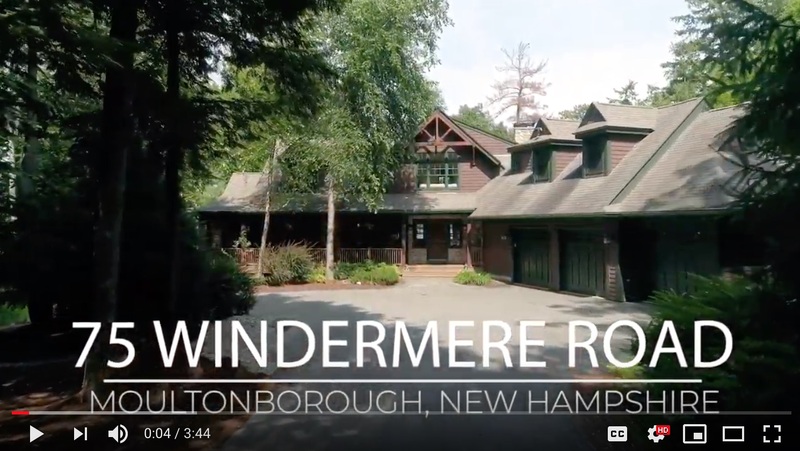 32 Captains Walk in Moultonborough was purchased for $1,380,000 as a tear-down property. It was a 4000 sq. ft. 1985, 4 bed, 5 bath home. It is now undergoing new construction already with foundation being installed now. It is being built as a spec listing and will be coming soon to the market! Let us know if you are interested! We are guessing it will be an Adirondack style as that is what we typically see from this builder on the lake.